CUBIC’s latest innovative platform based panel system is time and cost saving to users and panel builders. CUBIC has introduced a unique standalone panel system for main and distribution switchboards up to 800A CPS25. The name is a contraction of CUBIC Panel System 25, where 25 is a reference to the DIN norm. In its simplicity CPS25 is a standardised and independent platform solution for switchboards up to 800A. This panel system combines an extremely easy installation with a com-petitive price and great quality. CPS25 eliminates time consuming installation and multiple parts. Few standard parts and only one type of screw make CPS25 the most innovative and competitive panel system in the market. Torben Fristrup, CEO of CUBIC, says: "With CPS25 we have strengthened CUBIC’s overall prod-uct portfolio and competitive power. CPS25 is the perfect supplement to the well-known Modular System, and together with CU-mini it is a strong platform in the co-operation with our customers. To the end-user it is a competitive product in a contemporary design." CPS25 is developed and designed with the user’s demands, needs and wishes in mind. An easy configuration and quick installation make it possible to design the solution in the morning and mount it in the afternoon. CPS25 is assembled through a very clear four step configuration, and is the fastest assembled panel solution for switchboards up to 800A available in the market. 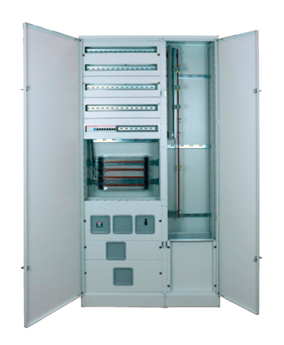 The system is available in two standard sizes, and covers 90% of the market for switchboards up to 800A. CPS25 is applicable in all businesses and industries, where switchboards for main and distri-butions purposes are necessary, such as offices, public buildings, industries, airports, shopping malls, schools, hospitals etc. As a standard CPS25 is IP3X, but with a large number of additional options it is possible to adapt CPS25 to meet individual needs and specifications. CPS25 is designed in accordance with IEC/EN 61439,-2 ,-3. CUBIC has completed the necessary verification to ensure that only a minimum is left to the customer. Standard inserts covering the most common component manufacturers make sure that the panel builder stays independent of component brands. CPS25 thus ensures that the panel builder is not bound to a specific component brand.